How can we cut down on the time you spend between trips? Where can you get trips when you’re on your way home or on the way to run an errand? Every day hundreds of Uber engineers, product managers, and designers are working hard to solve these kinds of questions. Our mission is to make the Uber experience as rewarding and stress-free as possible for you. Many drivers say they choose Uber because they want to be their own boss, set their own schedule, and get work at the touch of a button. That’s the beauty of the on-demand economy: you define the work you do, it doesn’t define you. But we also have heard from drivers like you that there are plenty of things we can do to make driving more empowering and worth your while. Last year, we revamped the driver app to make it more intuitive and easy to use, and have launched new features and new perks in our driver rewards program. And beginning today, we are rolling out a number of features and rewards in more cities to help you get the most out of your time on the road. Driver Destinations: Driver Destinations is all about making it easier to fit work around your life — not the other way around. Twice a day, you can input your destination – say if you’re heading to work in the morning or going home after a long day — and Uber will only send trip requests that are on your way. Drivers in a handful of cities in the U.S. and around the world have already been using this tool. This week, we’ll expand it to over a dozen U.S. cities, with more cities launching globally soon. Pause Requests: Need lunch or coffee or a breath of fresh air, or ready to call it a day? Now you’ll be able to just hit pause — literally – to stop new requests from coming in while you’re completing your last trip. This tool is designed for drivers who want to log off the app after dropping off their passenger, instead of having to decline trip requests while their last rider is in the car. Simply press the button again when you’re ready to get back on the road. We’ll be piloting this feature later this month in several U.S. and international cities. Paying drivers for waiting past 2 minutes: Your time is valuable, so it’s frustrating when riders run late or cancel when you’re already at the pickup location. We’ve been trying something new: paying drivers for wait times that exceed two minutes. In the cities where we’ve been testing this, we’ve seen that riders are more likely to be prompt. We’ll be expanding the policy to a dozen U.S. cities this month, with more coming soon. Instant Pay: Our Instant Pay option has been a big hit with drivers who love being able to get paid as often as they want for free through a GoBank Uber Debit Card. We began piloting this feature in San Francisco and a few other cities earlier this year. We’re pleased to announce that Instant Pay is now available in all U.S. markets. To apply for a GoBank Card, simply click on the “Earnings” tab in the driver app or click the “Instant Pay” tab at partners.uber.com. Uber Greenlight Locations: Drivers tell us how important it is to have local Uber staff available when they need help. Today we offer in-person assistance in over 250 locations around the world. We’re continuing to invest in our in-person locations, formerly known as Partner Support Centers. And with our expanded services comes a new name: Uber Greenlight locations. Our doors are open and we’re here to help! 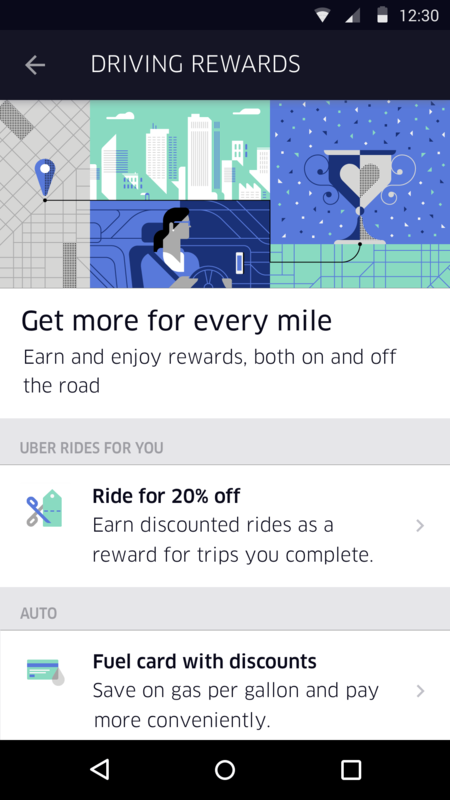 Ride Discounts: According to a recent survey, one in four people who drive with Uber in the U.S. also use the Uber app as passengers. It’s great to be in the back seat sometimes — not least because you can experience first-hand what it’s like to be a rider. We’ve launched a pilot in a few cities to give drivers discounts on Uber rides. Drivers who are part of this pilot get 15% off an uberX ride for every 10 trips you complete in a week, or 50% off an UberBLACK ride for every 20 trips done in a week. We’re running these discounts in different U.S. cities over the next several weeks. If they improve the overall experience, we’ll make this pilot permanent. So go ahead — be a backseat driver. We’re constantly looking for ways to improve the driver experience. In recent months we piloted in-app phone support and launched Fuel Finder to make it easier for drivers to save money at the pump. And we’re glad that so many drivers continue to take advantage of fuel discounts, savings on cell phone plans, and discounts on oil changes and maintenance through our driver rewards program. Last but not least, today we’re launching a new blog for drivers called Behind the Wheel. This will be your one-stop for news that affects you and information on driver products and perks. As we move forward, drivers will continue to be our greatest source of inspiration. After all, who knows better what would improve the Uber experience than the people who use it every day? So keep telling us how we can make Uber better and we’ll keep working to make it a reality.